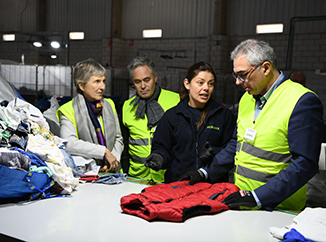 Carlos Izquierdo, Regional Minister for the Environment and Territorial Planning of the Community of Madrid, visited the Humana Resources Textile Preparation Plant in Leganés today. The objective of the visit to these facilities has been to raise awareness of the importance of textile waste according to the Strategy for Sustainable Management of Waste 2017-2024 in the Community of Madrid. As pointed out by the Ministry itself, thanks to the preparation for reuse and the promotion of recycling, it prevents tons of textiles from reaching the landfill each year and having a second life, as well as contributing to social projects that have numerous benefits in our environment. Waste management is one of the key pieces of sustainable development. And within it, the textile, considered the fifth fraction in importance, requires new solutions and processes capable of responding to the challenges it poses: every year the Spanish discard 1 million tons of used clothing and footwear. 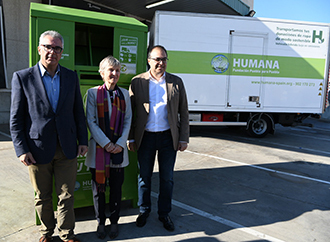 However, only 10% of that amount is recovered by authorized managers, according to data from the Waste Agency of Catalonia and the Ministry of Environment and Ecological Transition. The Strategy for Sustainable Management of Waste of the Community of Madrid 2017-2024 itself establishes the composition of household and commercial waste generated per person, which indicates that the average per capita gross is 30.65 kgs in the case of textile. This figure represents 7.82% of the domestic and commercial waste generated in the region. 25.48 kg are collected in the rest bag. Discarded textile products have a market value that makes their reintroduction into the market economically viable, either through their reuse or recycling. The European Union has decisively marked the agenda in terms of textile management: on the one hand, by placing in general terms at 55% the percentage of waste that must be recycled before 2025. In addition, as of that date The selective collection of this material will be mandatory in all European municipalities. The mandatory separate collection (clothing, footwear and home textiles) in the municipalities of more than 20,000 inhabitants, through an adequate collection network through Clean Points, containers, collaborating establishments, social entities, etc. before December 31, 2019 . The municipalities with a population greater than 5,000 inhabitants must carry out the separate collection of textile products before December 31, 2021. Promote voluntary agreements with the trade for the separate collection of textiles. 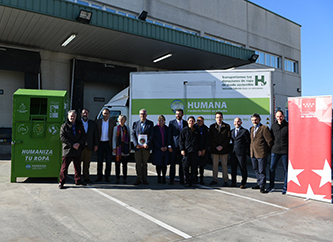 In this context, in order to continue advancing and responding to the challenges posed by an efficient management of textiles in the XXI century, Humana Pueblo Foundation for People launched in early 2018 the second phase of its Preparation Plant for Reuse of Leganés.